to eat, they have something for everyone! 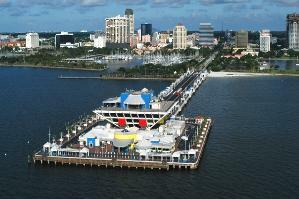 local waterways of the Tampa Bay area with an educated staff that leads tours through the aquarium. The world's largest private collection of Dali artwork - oils, watercolors, drawings, graphics, and sculptures. There's daily guided tours and a gift shop. Located in downtown St Petersburg at 1000 Third St.
game and take a break from the summer heat as this is an indoor Stadium. flowering trees and fruit trees.